While I have spent the last several years researching the history of Jeanne Marguerite Chevalier, my eighth great grandmother, there is at least one other Jeanne whose story should be included in this blog. That’s Jeanne Savonnet. The life of this second Jeanne is more well-known than the life of Jeanne Marguerite, but there are several parallels between the two. Jeanne Savonnet was also a Fille du Roi, arriving in 1670, one year before Jeanne Marguerite. She was married three times and widowed three times. After her arrival in 1670, she quickly married Jean Soucy dit Lavigne, a soldier in the Carignan-Salières Regiment. Her first husband, with whom she had four children, died in some mysterious way, the details of which have yet to emerge: “sometime between May 1677 and August 1679.” In August of 1679, she married Damien Bérubé, a compatriot of Robert Lévesque and Jean-Baptiste Deschamps from the Pays de Caux in France. They moved to Rivière-Ouelle, Jeanne Marguerite’s home of just four months. There she had six more children. Damien died in 1688 during the epidemic that struck New France, taking with it two of their children as well. Four years later, she married François Miville dit Le Suisse, with whom she had her 11th child. He died in 1711. She outlived Jeanne Marguerite by 5 years, dying in 1721. 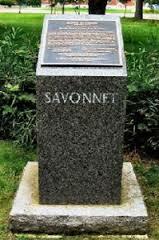 Jeanne Savonnet is also an ancestor of mine. Marie-Josephte Bérubé, one of her granddaughters, married Jean-Baptiste Lévesque, son of François-Robert and Charlotte Aubert, and thus one of Jeanne Marguerite’s grandsons. Jean-Baptiste and Marie-Josephte then proceeded to have at least eight more generations of Lévesques, including yours truly. However, in other respects this second Jeanne is different. She was born in Paris; her parents are known, Jacques Savonnet and Antoinette Babillotte, but her place and exact date of birth have not been found. She was placed in the hospital of Pitie-Salpêtrière at an early age because her father died and her mother had to abandon her. Salpêtrière was one of the two institutions in Paris from which so many Filles du Roi were recruited. Jeanne Savonnet had nine surviving children, Jeanne Marguerite had only three. And those surviving children, of three different husbands, have spawned even more descendants, bearing the names of Soucy, Bérubé, and Miville, and many variations. She also is distinguished for having a monument in her name in the cemetery in Riviere Ouelle, placed there by the Soucy Family, that has done a great deal to spread her name. 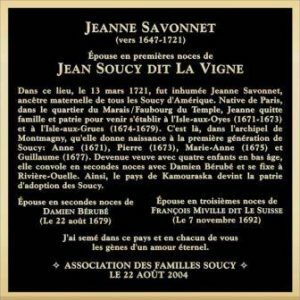 While Jeanne Savonnet has perhaps achieved more fame than Jeanne Marguerite, both Jeannes do not receive the recognition they deserve as the founding mothers of long lines of descendants. In Hautot-Saint-Sulpice, Robert Lévesque’s birthplace, an organization has been formed to welcome his descendants as well as those of Damien Bérubé, born in Roquefort, a small village less than 5 km from Robert’s village. However, there is little recognition given to their wives, the mothers of all their children and so many descendants!!! !